K.O. I'm from Geneva, Switzerland. I've been exposed to a variety of different people, ideas and other things. Growing up always has its ups and downs, but I made it through. My name, K.O., doesn't really have a story, but it just came to me like that, and then it stuck. It stands for 'Keeping It Original', because what I do in music is me and nobody else. K.O. Yes there was actually a situation. Basically it was me and my friends messing around with a tape recorder and a rhyme book. After a while we started taking it serious and eventually began recording our songs on PC. OD I love rap and always have done. I’ve always wanted to be able to express myself over beats but my main focus has always been writing and producing tracks and sometimes songs. I don't rap a lot but I guess I’d have to say Will.I.Am as his raps are very G as in PG and are commercial as well as being non-threatening. My Labels’ most commercially successful track is called “Get Them Hands” which I’m rapping on. K.O. 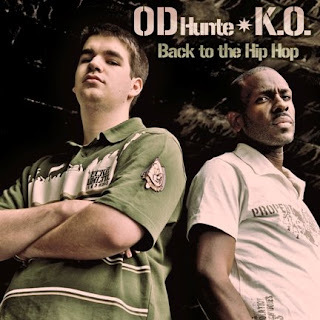 The "Back to the Hip Hop EP" is a creative 4 track classic effort by myself and producer OD Hunte. The EP brings the listener back into the days when you actually needed lyrical skills to be signed to a label, where storytelling and self expression were the messages in Hip Hop, all while having a new school twist up in the mix. OD Yup. Back To The Hip Hop -the EP is a good introduction to our work together as we give you a party joint “Blow Up”, an autobiographical joint “Be This Way”, a factual joint “The Art” and a story joint “I Gotta Go”. People are digging the production and lyrical content on all these tracks so the combination just works. The EP is available from all major music retailers online worldwide, ITunes, Amazon, Napster etc. and is released on December 1st 2008. K.O. Recording in the studio works better for me, I can relax more, take my time with a track, get it perfect. OD I prefer creating magic in the studio. That’s where I’m most comfortable. I like making records. K.O. To sum me up, I more or less like to be different from the crowd in terms of personality. Some know me as chilled, others know me as goofy. I love making music, but when I'm not doing that I'm out with my friends. OD I’m a workaholic. Everyone who knows me knows I’m always busy working, grinding, thinking, figuring stuff out. I believe in “doing for self”. Don’t expect people to do for you. I get on with people generally. I enjoy my work and chilling out with a DVD and the fam when I can. I love learning. The internet is genius... instant research and entertainment. K.O. Just find beats and do a load of music, then try to promote it, get the name out. Simple. OD I found out what the process for promoting a record is and then decided to apply it to my music. I want as many people to hear my music as possible. There has been a traditional way of getting your music out but that has changed now with the internet, modern technology, TV and games. There are alot of opportunities. What’s your favorite clothing label? K.O. Probably Ecko or South pole, but anything that looks good is a good piece of clothing. OD I’m not really into designer clothes. I hink so much of it is over priced for what it is. Okay if something is made well then that’s one thing. For me any label is cool as long as the cut and fit is quality and it looks good. I want to eventually have my own label called Southern Cuba though..like Sean Jean. Forget the budget, what would be your dream collabo? K.O. Defiantly something with Dr. Dre or DJ Premier. OD I’d like to work with Missy - she called me a few years ago but we never worked together, Eminem, Ludacris, Method Man, Busta, 50, Mos Def, Pharoa Monch, Immortal Technique, Mase, Bubba Sparkxx, Andre 3000, Sean Paul and Collie Buddz and last but by no means least Marsha Ambrosia from Floetry. THE most magical British singer for me ever! K.O. I'm being me, simple as that. I bring people my vision, my thoughts, and my experiences, and hope that people can relate to what I say. Also the fact that many people in the game can only talk about specific things, such as cars they don't have, or money they don't have, I can talk about anything, because in my version of hip hop, it is MEANT for you to express what you're feeling, what’s on your mind. OD From a business point of view I’m trying to take it to the next level. Artist think by “dropping by and showing love” on myspace that means something. That’s booty chatter... I’m doing radio, press, online and club promotion and soon TV advertising with this project. Plus on top of that I’ve been getting tracks into huge international games with companies like EA Sports and films like American Pie 6. That’s above what the average unsigned artist is doing..
K.O. I just don't understand why ringtones are selling for more then actual tracks, and it isn't even a full song? and don't you think A Millie is the most annoying beat in the world, yet EVERYONE did a freestyle on it? Music is going crazy.... especially when people are making dances which don't even make sense, the Wu Tang dance doesn't have anything to do with the Wu Tang Clan, and the Dre dance doesn't have anything to do with Dr. Dre. Lastly, why is Lil Wayne the hottest rapper? Surely, he's not the best, I can think of 5 people who are alive who deserve that position. OD. Yes, can people please stop with the N word and negativity in rap. Its so backward and unproductive. Violence in music isn’t cool. I’m not saying write your raps for the Disney channel but get some balance..Although it’s tricky when you have huge blockbuster films like James Bond where dude is running around killing people and people think it’s cool and entertaining. Good thing he’s not black. But then you never know. Never thought we’d ever see a Black Presidential candidate..